The microbiota affects the development of the immune system and, consequently, the development of eczema. Probiotics, used by both mother and child, have been proven capable of protecting against the development of eczema. The selection of bacterial strains, dosage and the period of administration have been shown to be crucial for efficacy and safety. Allergies are becoming more and more prevalent in the Western world. Depending on people’s age, we see different manifestations of allergy, including eczema, food allergies and hay fever. Eczema or atopic dermatitis is one of the first manifestations of allergy and affects approx. 20 percent of all children1. Genetic background plays an important part in this as well. If one of its parents has atopy, a child will be 25% more likely to develop atopic conditions. If both parents have atopy, this figure goes up to 50%. Children who have had a type of allergy at a young age, are at a greater risk of developing another allergy manifestation. Such a succession of different manifestations is also referred to as “allergic march”2. Allergies have an adverse effect on quality of life and represent a major financial burden for society3. The development of the immune system starts immediately after birth and is intimately linked with the development of the microbiota4. The immune system learns to distinguish between harmful and harmless substances by coming into contact with many different microbes. Immediately after birth, the immune system comprises high numbers of Th2 cells and less Th1 cells. Contact with pathogens and experiencing infections stimulates the immune system via Th1 cells, which will ultimately result in an appropriate Th1/Th2 balance. Regulatory T-cells (Treg cells) are important in further strengthening this balance. Allergies develop when the immune system becomes unbalanced and is dominated by Th2 cells. The strong increase in the prevalence of allergies in the Western world is presumed to be linked to the reduced exposure to microbes as a result of improved hygiene. This prevents a balanced proportion of Th1 to Th2 cells5. We also know that the microbiota in children with eczema has a different composition than that in children without eczema6. Factors that influence this composition include the way in which a child is delivered and what it is fed. Stimulating the development of the microbiota to reduce the likelihood of eczema therefore seems a sensible approach. What role can probiotics play in this? There is ample evidence that probiotics can reduce the likelihood of eczema in babies7 89 10. Whether this is effective will depend on a number of crucial factors: the selection of bacterial strains, dosage and the period of administration11. Many meta-analyses demonstrate that the best effect of probiotics in this target group is achieved by perinatal use of probiotics, i.e. before the delivery by the mother and after the delivery by the mother or the child itself. The World Allergy Organisation (WAO) recently published an article recommending practical applications of probiotics based on the wealth of available literature10. These guidelines indicate that pregnant women with a high risk of having a child with allergies will benefit from the use of probiotics during their pregnancy and for as long as they breastfeed. Another recommendation is to give probiotics to the child itself if there is an increased risk of developing allergies10. Bacteria communicate with the immune system via antigen-presenting cells, including dendritic cells. Signals of the microbiota (and probiotics) direct naive T-lymphocytes to develop into a particular form12. Specific bacterial strains can influence the immune response in allergies by suppressing Th2 cells and stimulating the response of Th1 cells and regulatory T-cells13. Such strains can potentially prevent the development of eczema. Figure 2: T-cell differentiation effected by bacteria, indicating characteristic cytokines and transcription factors for Th1, Th2, Th17 and regulatory T-cells (Treg). In several in-vitro studies, bacterial strains have been screened for their allergy-preventing potential14. The bacterial strains were selected because these strains were found to be able to inhibit Th2-related cytokines IL-4, IL-5 and IL-13, and to stimulate Th1-related (TNF-α and IFN-γ) and Treg-related cytokine IL-10. The preventive effect of the formula on the development of eczema was studied in the PandA study, a double-blind, placebo-controlled study in which 102 pregnant women and their newborn babies participated15. Given their family history (family members, especially mothers, with a predisposition for allergies), pregnant women used a daily dose of 3 grams of probiotics during the final 6 to 8 weeks of their pregnancy. After the delivery, the babies were given the same daily dose of probiotics for their full first year of life. The PandA study showed that the use of these probiotics is safe – both during pregnancy and for newborn babies – and reduces the likelihood of eczema. Three months after the birth, the incidence of eczema in the probiotics group was 58% lower than in the placebo group – a significant difference. The absolute difference in incidence was still evident in later follow-up analyses at the ages of 2 and 6, although the significance no longer applied16. Figuur 3: Incidence of atopic eczema with or without the use of the Ecologic® PANDA formulaNiers, L. et al. 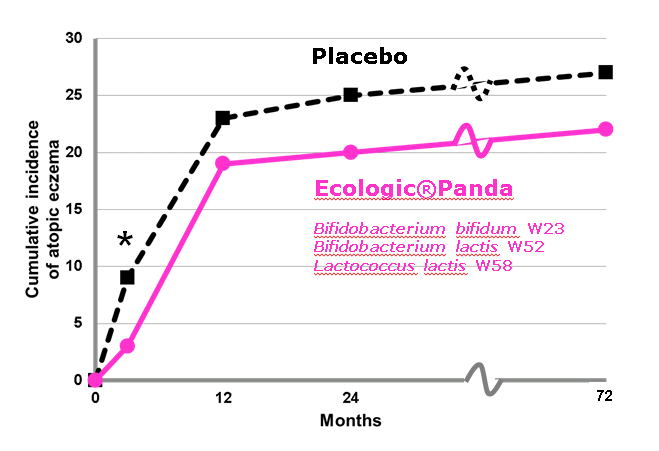 The effects of selected probiotic strains on the development of eczema (the PandA study). Allergy 64, 1349-1358 (2009). The PandA study not only demonstrated that probiotics can reduce the likelihood of eczema, but also provides information on the effect of the selected strains. In the first year of life, faecal samples of children from the probiotics group were found to contain greater numbers of the administered species Lactococcus lactis, Bifidobacterium bifidum and Bifidobacterium lactis than those of children in the placebo group. This shows that the bacteria were able to survive passage through the stomach in vivo and to be active in the intended section of the GI tract17. The functionality of the gut microbiota has been researched using metabolic profiles in faecal samples taken when children were three months old. Compared to children that developed eczema in the first two years of their life, children without eczema had far more short-chain fatty acids (SCFAs), succinate, phenylalanine and alanine, and less glucose, galactose, lactate and lactose in their stools. This difference was already evident at the age of three months, in many cases well before the clinical manifestation of eczema18. The faecal analysis also showed that administration of this specific combination of bacterial strains appears to boost the synthesis of SCFAs, acetate and butyrate in the gut. This is probably an indirect reaction because none of the selected bacterial strains produce butyrate13. This finding is indicative of the possible mechanisms of action that are involved in the efficacy of the bacterial strains Bifidobacterium bifidum W23, Bifidobacterium lactis W52 and Lactococcus lactis W58 in preventing eczema. The research formulation Ecologic® Panda is not sold as a consumer product. However our worldwide business partners offer the formulation Ecologic® Panda as their own branded product. Thus the specific bacterial composition can be found in different products around the world. 1. Williams, H. C. Clinical practice. Atopic dermatitis. N Engl J Med 352, 2314-2324 (2005). 2. Shaker, M. New insights into the allergic march. Curr Opin Pediatr 26, 516-520 (2014). 3. Zuberbier, T., Lotvall J Fau - Simoens, S., Simoens S Fau - Subramanian, S. V., Subramanian Sv Fau - Church, M. K. & Church, M. K. Economic burden of inadequate management of allergic diseases in the European Union: a GA(2) LEN review. Allergy 96, 1275-1279 (2014). 4. Gensollen, T., Iyer, S. S., Kasper, D. L. & Blumberg, R. S. How colonization by microbiota in early life shapes the immune system. Science 352, 539-544, doi:10.1126/science.aad9378 (2016). 5. Bridgman, S. L., Kozyrskyj, A. L., Scott, J. A., Becker, A. B. & Azad, M. B. Gut microbiota and allergic disease in children. Ann Allergy Asthma Immunol 116, 99-105 (2016). 6. Bjorksten, B., Sepp E Fau - Julge, K., Julge K Fau - Voor, T., Voor T Fau - Mikelsaar, M. & Mikelsaar, M. Allergy development and the intestinal microflora during the first year of life. J Allergy Clin Immunol 108, 516-520 (2001). 7. Dang, D. et al. Meta-analysis of probiotics and/or prebiotics for the prevention of eczema. J Int Med Res 41, 1426-1436 (2013). 8. Panduru, M., Panduru Nm Fau - Salavastru, C. M., Salavastru Cm Fau - Tiplica, G. S. & Tiplica, G. S. Probiotics and primary prevention of atopic dermatitis: a meta-analysis of randomized controlled studies. J Eur Acad Dermatol Venereol 29, 232-242 (2015). 9. Sanders, M. E. et al. An update on the use and investigation of probiotics in health and disease. Gut 62 (2013). 10. a. b. c. Fiocchi, A. et al. World Allergy Organization-McMaster University Guidelines for Allergic Disease Prevention (GLAD-P): Probiotics. World Allergy Organ J 8, 4 (2015). 11. Prescott, S. L. & Bjorksten, B. Probiotics for the prevention or treatment of allergic diseases. J Allergy Clin Immunol 120, 255-262 (2007). 12. Walker, W. A. Initial intestinal colonization in the human infant and immune homeostasis. Ann Nutr Metab 63 S2 (2013). 13. a. b. Niers, L. E. et al. Identification of strong interleukin-10 inducing lactic acid bacteria which down-regulate T helper type 2 cytokines. Clinical and experimental allergy : journal of the British Society for Allergy and Clinical Immunology 35, 1481-1489 (2005). 14. Niers, L. E. et al. Selection of probiotic bacteria for prevention of allergic diseases: immunomodulation of neonatal dendritic cells. Clinical and experimental immunology 149, 344-352 (2007). 15. Niers, L. et al. The effects of selected probiotic strains on the development of eczema (the PandA study). Allergy 64, 1349-1358 (2009). 16. Gorissen, D. M. et al. Preventive effects of selected probiotic strains on the development of asthma and allergic rhinitis in childhood. The Panda study. Clinical and experimental allergy : journal of the British Society for Allergy and Clinical Immunology 44 (2014). 17. Rutten, N. B. et al. Long Term Development of Gut Microbiota Composition in Atopic Children: Impact of Probiotics. PLoS One 10, e0137681, doi:10.1371/journal.pone.0137681 (2015). 18. Kim, H. K. et al. Probiotic supplementation influences faecal short chain fatty acids in infants at high risk for eczema. Beneficial microbes 6, 783-790 (2015).